The Presidency has accused the leadership of the opposition People’s Democratic Party (PDP) of running the party like a militant organisation. Senior Special Assistant to the President on media and publicity, Mallam Garba Shehu, at a press conference with State House Correspondents yesterday also noted that the victories recorded by the ruling All Progressives Congress (APC) at various by-elections conducted around the country were attestations that President Muhammadu Buhari and his Vice, Yemi Osinbajo, would win the oncoming 2019 Presidential election. Asked to respond to the allegation of vote buying at Ekiti governorship and National Assembly by-elections in Bauchi, Katsina and Kogi states, by the PDP, Shehu said, “One is to say that bribery of voters or vote buying is an offence in this country, I think that citizens who have evidence regarding this, has a duty to report to the law enforcement agencies, this is the way to help the country. “Secondly, I think that it is not the right attitude for a political party; a so called opposition leader to conduct their affairs like a militant organization, a political party cannot be run like a militant organization. If you have disagreement on the outcome of an election, they know the process and they know it because they abused it before. On implications of the APC victories, the Presidential spokesman said “It is clear that from election after election, Nigerians are reposing confidence in the Buhari/Osinbajo presidency. Each of these election victories is considered to be epic in nature because none of these elections was an ordinary election. We are happy that we have won and on behalf of the president and the acting president, we like to say thank you to Nigerians who continue to repose their confidence in the leadership of the APC administration. He continued “For a quick review, maybe one, two, three or four lessons can be taken from the victories that the party has been recording. “First of all is to say that these decisive victories are indications that clearly, Nigerians have spoken that President Buhari maintains his momentum. That these victories place Buhari/Osinbajo presidency in very good stead for next year’s election. It is a statement of fact that the APC will go into election next year with every confidence that the elections will be won and that Nigerians by this statement, will also say that they no longer have time for politics of insult and diversion, mudslinging and ‘monkey dey work, baboon dey chop’ politics of the PDP, and equally important is that these election victories are a clear message to the National Assembly that all that Nigerians are interested in is that the business of government should go on. Senior Special Assistant on media and publicity in the Office of the Vice President, Laolu Akande, who also briefed disclosed that the government had recently in Lagos lunched a micro credit scheme where market women are being advanced N10,000 repayable loan. According to him, 500,000 persons are expected to benefit from the new tranche of Social Investment Program (SIP). The revolving loans are to be repaid within six months. 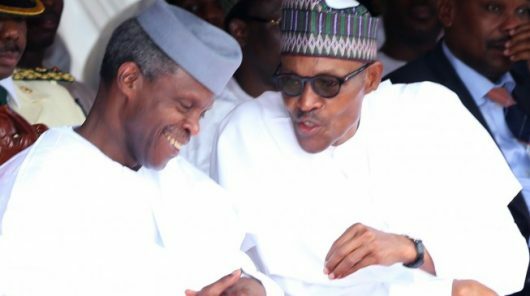 Meanwhile, acting President, Prof. Yemi Osinbajo, will still remain the running mate of President Muhammadu Buhari in the 2019 presidential election, the presidency said on Monday. Senior Special Assistant to the President on Media and Publicity, Garba Shehu, disclosed this in an interview with State House correspondents at the Presidential Villa, Abuja. According to him, the victories recorded by the All Progressives Congress in legislative elections held in three states at the weekend were indications that victory was certain for the Buhari/Osinbajo presidential ticket in 2019.